Side story: Show By Rock!! Short!! Before you assume I am a SB69 hater, please check my MAL. The first season is listed as my favorite and I truly love this franchise. The reason why it scored this low, is because of my disappointment. Yes. I am very, very disappointed in this season. Heck, even the specials had better writing. Sanrio could've done so much better. 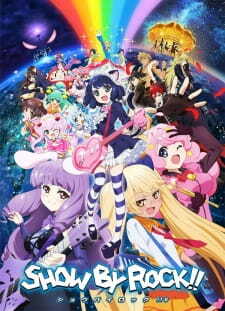 I wasn't expecting a solid or deep story, but Show By Rock # was a true trainwreck imo. The plot was all over the place. Whereas S1 had a very clear premise, it seemed like the creators themselves didn't really know where they wanted to go with their story in S2. So we have this issue with the Dark Queen, then Dagger jumps in again, Tsurezure are plotting on something and there's also ACAREAFACT boycotting Shingancrimsonz. Oh, we also get Bud Virgin Logic's personal struggles as well. And some backstories (which were mostly really nice btw). But honestly, that's a lot for a series with only 12 episodes, especially if you consider they still managed to add some episodes where the story had little to no progress. Then again, the story itself felt like a carbon copy of season 1, except we got a lot of new characters, that had barely screentime. What disturbed me the most is how the series seemed to make a big deal out of certain events, that were solved in a few seconds. Evil characters turn into cinnamon rolls after they realized their love for music. I think it'd be a better idea if the series sticked to the games canon. It had so much potential... I know I was expecting too much, but the beginning made me expect those things. It seemed like they took a little bit 'too' much plot and weren't able to handle it. Look. This series wasn't bad. Just disappointing. There were a ton of great things too! As I said earlier, I was really happy to see some character getting backstories. As usual, the music was amazing too! I loved the song at the end btw! I also thought it was great how we got to see a lot more of the in-game bands! Every time one of them appeared, I was so happy! And I'm also really thrilled that my hc's about Ailane turned out to be canon! Even though I'm bitching a lot about this series, I hope (but doubt) they'll make a third season. At the end I still love the characters, artstyle, music and general idea. Yes this series was disappointing, but I still love it somehow, if that makes sense. If you're reading this, you're probably iether have recovered from pancreatitis from the first season and if you don't, please refer to my review of the first season and/or watch the first season since this is a sequel of the first season. Does the second season called 'Show by Rock! !#" really suffer from seasonal rot? Sadly, I'd have to admit it kinda does compaired with the previous season, but it's a no-brainer answer if your anime adaption is based of a mobile rhythm game. It's already impressive for the series to manage in getting a sequal because many anime game adaptations only manage to produce only one anime season that doesn't really get recieved well most of the time. Compaired with the first season, the story of this one is a bit dissapointing to say the least. You can basicly kinda predict what will happen at the finale when you have watched the first episodes and if you're familiar with the previous season. For some that could be a bummer, but I didn't took the previuous season serious and so you should not take the story for this season serious iether. It just keeps on following the story what happend in previous season. If you liked the randomness and cuteness from previous season, you would probably like this season aswell. On the emotional aspect of things, I find the story bit more wholesome compaired with the previous season. But then again, I have to keep in mind this anime is still is a sequal of an anime adaptation of a mobile rhythm game for iOS and Android devices. Sadly the bad & wierd CGI transaction does make a return just like in the previous season that in my opinion hurts the anime quite a bit. It's probably one of the key points why most people don't like this anime series I guess. It just feels it gets way less often used compaired with previous season. On the other hand the rest of the art-style is once again quite decent and cute enough to get diabetes. The sound was atleast music for my ears and for sure indeed one of the main selling factors for this show. I'm a fan myself of instruments that get used in mainly rock & metal music, so I really can't complain on the audio part. I also really can't say anything bad about the voice acting iether. All the charathers from the previous season make a comeback like the main cute kemonomimi girls from Plasmagica, the kemonomimi boys from ShinganCrimsonZ that like to pose, the girls from CritiCristia and several others you have seen from the previous season. Yet, there will be new charathers introduced. Even GAR lovers would get thier own fanservice with a new charather they would probably enjoy because how he got buffed. Just like the previous season, this anime season was a fun show to watch while lying back comfortable. Every now and then the anime made me chuckle because of the funny randomness, wich is an accomplishment already since I rarely chuckle or laugh during watching media. In overall, I think I can let pass the second season of Show By Rock!! just above average. It's just because I enjoyed the first season and I really can't complain about the second one, but I do can reconize some seasonal rot as I really can't see any stories left you can squeze out of an anime adaptation for a mobile rhythm game. In overall, I do can appreciate the work Studio Bones has done for this series. As someone who is a big fan of season 1, and has it as one of their all time favorites, this season was a disappointment, and on top of that, was an unneeded disappointment. Especially for a 12 episode show, it had way too much plot. New villains were introduced, but all of them felt half-baked, especially the Big Bad of this season. Her backstory was introduced one episode before the final battle, and she just leaves afterwards. Characters' backstories were revealed, but they were also half baked. My favorite part of Season 1 was the progression of Cyan's story. In this season, Cyan has reverted back to her panicky, shy self with no resolve, and barely gets any attention. While I do love the fact that other bands are getting more songs, I wish that the series itself was longer so Plasmagica isn't tossed into the corner. The original season wasn't known for stellar or groundbreaking animation, but it certainly did better than the second season. The second season had numerous scenes with bad or half-baked animation, especially the final episode. The 3-D animation, one of the best parts of the first season, is barely implemented, and for most songs, they use it only half of the time. The different styles are very obvious, especially in the final episode. Characters looked off, and the final battle was a disappointment animation-wise. At the very least, the music was decent. Plasmagica's new songs are mediocre, but in my opinion, the rest are good, especially the new bands' songs. While this part is very subjective, if you liked the first season's soundtrack, it's more of the same, just with more hard-rock in there. The OP and ED were very mediocre, and I skipped them most of the time. While most of the characters were half-baked, or all story progression from last season was erased, the new characters were interesting. Characters' backstories were revealed, and while the implementation of them was half-baked, the backstories themselves are very nice. While there are some anime I can't take my eyes off of, this wasn't one of them. I ended up playing Animal Crossing most of the time because the side plots were boring, or the animation was lackluster, or if the villain was monolouging for half of the episode. If you're looking for something engaging, just rewatch the first season. While it isn't the worst thing ever, unless you really want to be introduced to half-baked characters, this won't be something you'll enjoy. Hello! Thank you for taking your time to read this review. Show By Rock!! # is one of those anime where you will feel the absolute cringeworthy scenes yet stay because of whatever reason you have. I don't hate this show, I just feel like the second season was a bit disappointing. If you watched all of the episodes you will feel a bit disappointment because it didn't end the way we actually wanted. It's like we were expecting something yet it wasn't the one that we were expecting. I will not review it separately because the score is pretty much the same, a 7. They are somethings that they lack from the first season, some that got a bit better, but that's that. The reason why I give this anime a 7, mostly because it doesn't feel logical anymore given that the main character, Cyan, was teleported to Midi City using a phone. While in this season, she was transported here by a giant robot. It confuses you in the beginning, and this question will likely pop-up like, "Wait, Sound World is not a game world?!" or "Wait, Sound World does really exist?!". Then later more questions are added, only to confuse you. Art remained the same, but they left out the 3D animation a lot on this one, (that's what I feel like seeing anyway). This anime does give me some surprises and some clearance for characters about why they know each other. But there's something missing on this anime that made me feel like giving it a lower score this time. I like that they gave us a second season for this series, but I feel disappointed. But I guess it is just me, but then again, it is up to you after all if you want to watch this anime yes or not. Because I also watch other anime that have like the average score of 5 to 6. Once more, thank you for reading this review and I hope it was helpful for many readers out there who are thinking if they watch this show or not.